The Sounds Like Summer Concert Series in downtown Eau Claire’s Phoenix Park sees weekly crowds of 2,000 music fans enjoying all-local acts. Life in the north isn’t for the faint of heart. We endure lengthy winters, and our summer skies are short-lived. Our northern lifestyle looks like toughness, but it’s not just being tough. We believe hard work leads to good times. Perhaps that’s why when the weather is beautiful, it’s truly beautiful to us here … we’ve spent the prior months inside, working hard and enhancing our dreamy interpretation of northern summers and what that means. When summer finally arrives, we look forward to one of the most significant aspects of summer living – outdoor music. Over the past few years, the abundance, attitude, and accessibility of small-scale outdoor concerts in the Chippewa Valley has become a sincerely extraordinary, distinctive experience. Each concert series definitely brings its own panache, but together they create a synergy that shows off the richness of musical styles represented in this area and the talent possessed within each. There are at least a dozen weekly outdoor concert series on six different nights of the week throughout the Chippewa Valley (not including regular venues that offer outdoor performances sporadically, larger outdoor festivals, and indoor concert series). Depending on the day of the week, there could be more than 3,000 people attending an outdoor concert series per night and up to 10,000 attending per week from June to September – all within about a 40-mile radius of one another. Since we’re no big city here, such numbers are notable. For a listing of them all, visit VolumeOne.org/MusicCapital. 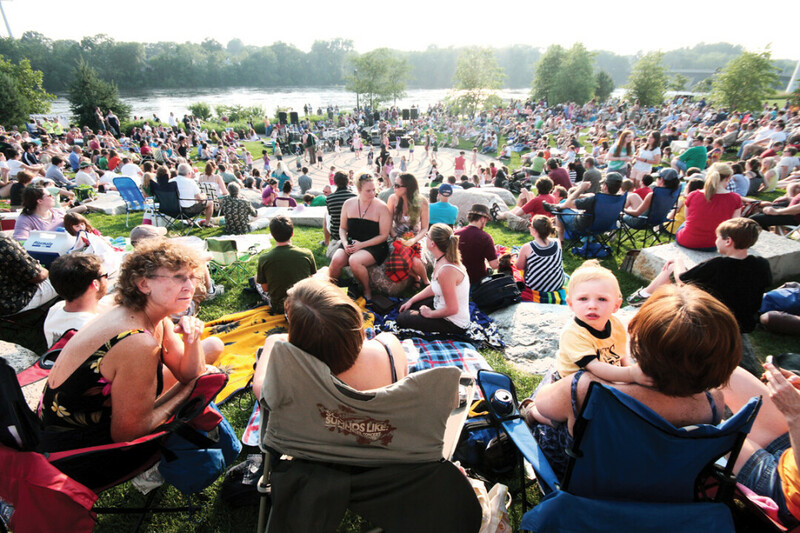 The ability to attend an outdoor music performance on a near-daily basis has become fundamental to life in the Chippewa Valley … and we’re lucky to have that. Many communities have embraced outdoor music culture and offer it in some way, but it’s different here. It’s not only that concerts exist in abundance, but also the quality and aptitude of the artists performing and the way these events are put together. For these we’re not talking big-time festivals, but local venues featuring local musicians organized by local people. Artists are beyond eager to participate, and more often than not they perform original material. Coordinators are passionate about offering something beneficial to their communities and showcasing the talent of the people within them. It’s like we have the magic formula for creating outdoor musical awesomeness. If you look back 10 years ago, this wasn’t the case. Most of the series we have now were developed in the last decade by dedicated individuals who saw the potential and/or recognized the growing demand brought on by the success of other series in the area. Many of the concert series organizers shared a common idea that the success of one series seems to inspire the next, which probably contributes to the fact we’ve seen the number of series snowball over the past several years. The success of larger ventures led to more demand for that type of entertainment close to home. Each concert series definitely brings its own panache, but together they create a synergy that shows off the richness of musical styles represented in this area and the talent possessed within each. From blues to indie, jazz to folk, big bands to rock – everything’s in the mix. A contributing factor to all of this, besides the multifaceted music culture, is the setting. The picturesque landscape is here year-round, but only offers amenable outdoor weather on a short-term basis. This exclusivity emphasizes our need and adoration for this kind of entertainment when it is obtainable and contributes to the amount of outdoor music we find readily available here in our home among the woods. It’s that time of year again. The one where we can finally unbury from the snow and go outside. In Wisconsin, we cherish our summer months closely, and try to do anything and everything we can while soaking up the sun. Music is definitely no exception. In the Chippewa Valley, we have a stunning music scene, and it never blossoms as beautifully as it does in these precious summer months. From major music festivals, to outdoor concert series, to bar shows, to one-off concerts, music in the great outdoors is where it’s at. So take a look at our newest special section and start planning your musical summer.